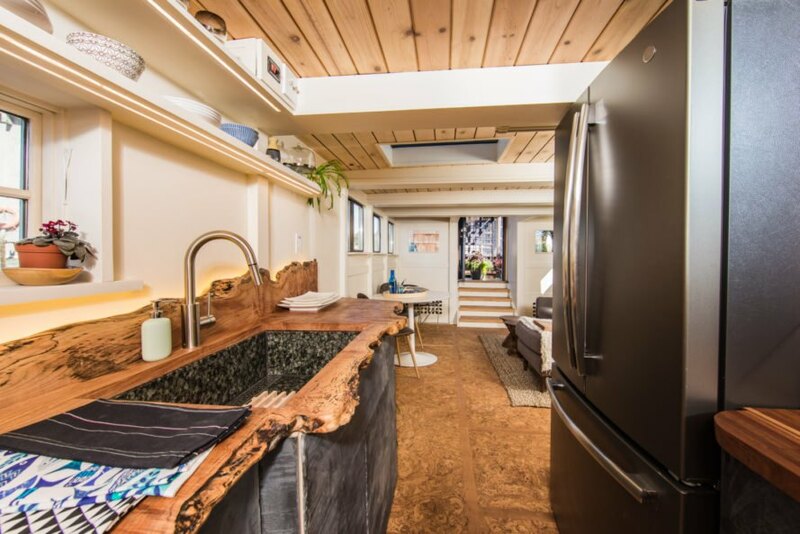 Tiny home builders are always popping up with new and ingenious ways to make a small space seem larger, and this gorgeous houseboat is no exception. The amazing interior design will make you forget all about the home’s 510-square-footage. 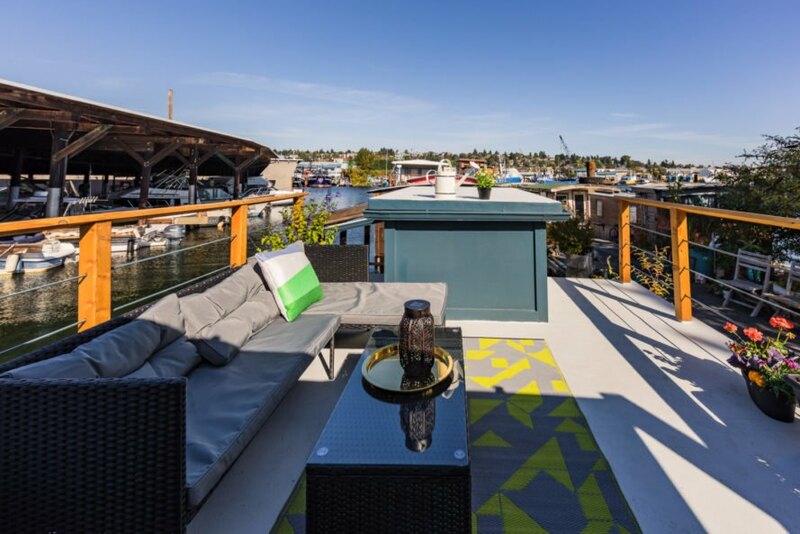 Located on Seattle’s ship canal just minutes from downtown, the charming cottage on the water comes with plenty of unique features, including a Japanese-style, cedar soaking tub, a custom-made elevator bed and an open-air rooftop lounge. 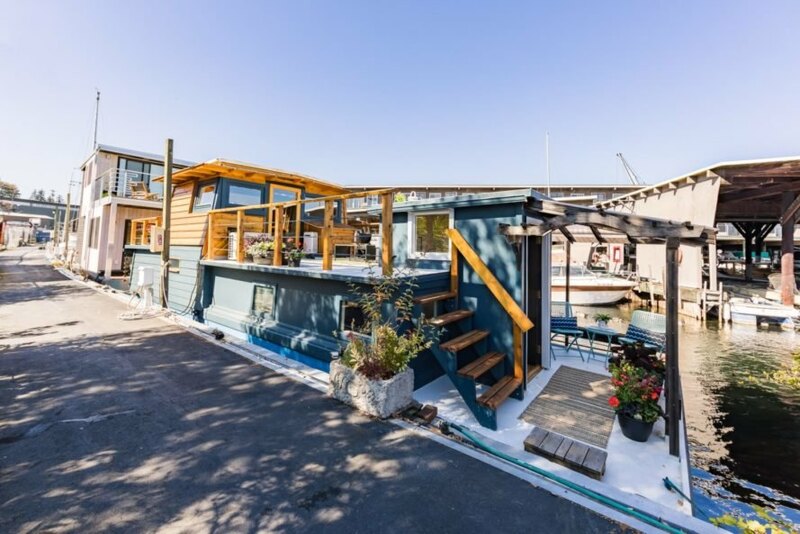 The beautiful houseboat, which is currently listed for $375,000, is clad in a serene blue hue that pays homage to its aquatic environment. Inside, the design is simply jaw-dropping. Light wood panels on the ceiling complement the calming white walls, while large windows naturally brighten the entire space. Throughout the home, unique cork flooring leads from the living room to the kitchen to the two bedrooms, seamlessly connecting the spaces. 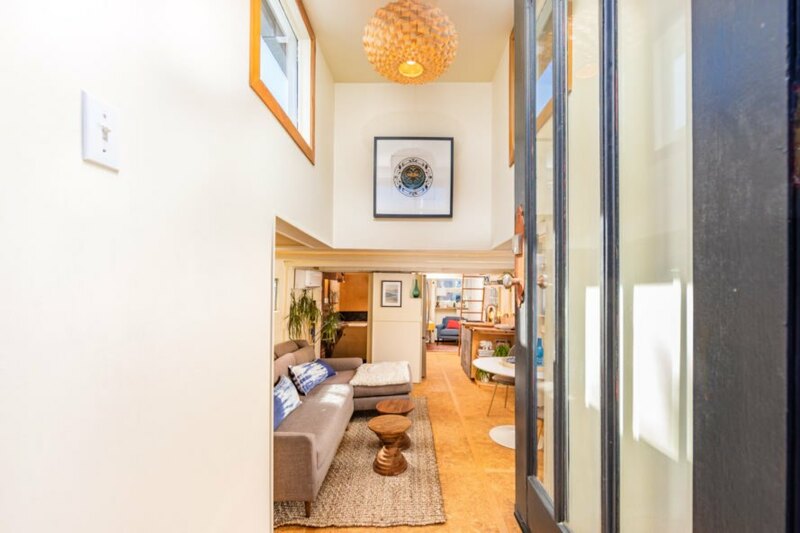 The interior, which has recently been renovated, uses a number of space-saving techniques and fabulous furnishings to open up the tiny home. The living room is a welcoming area with a long comfy couch meant for socializing. The sofa and most of the furnishings were kept in neutral shades to keep the atmosphere peaceful. Strategic pops of color here and there add a modern vibrancy to the design. In this home, every room has a strong personality. The kitchen was renovated with rustic, live-edge counters and backsplash. Salvaged slate cabinets were installed to lend an industrial touch to the design. The spa-like bathroom boasts a soothing pebble floor and an aromatic, cedar soaking tub. 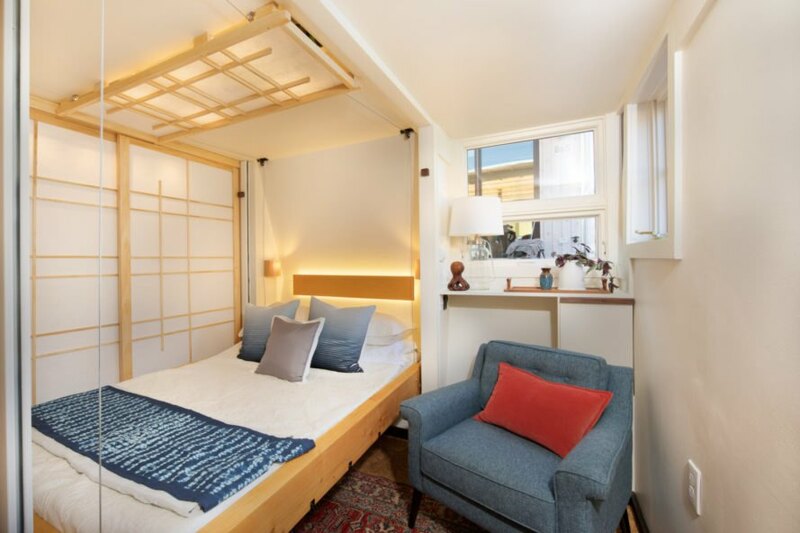 The two bedrooms also hide a few fun secrets, such as the vertical lift bed that converts one of the bedrooms into an office space or playroom when raised. Throughout the home, ample storage in the walls and stairs helps to avoid clutter. Of course, the heart of the home is found on the upper level lounge with a small sitting area, which leads to an open-air rooftop balcony. This space is perfect for entertaining, al fresco dining or just enjoying the serene water views. 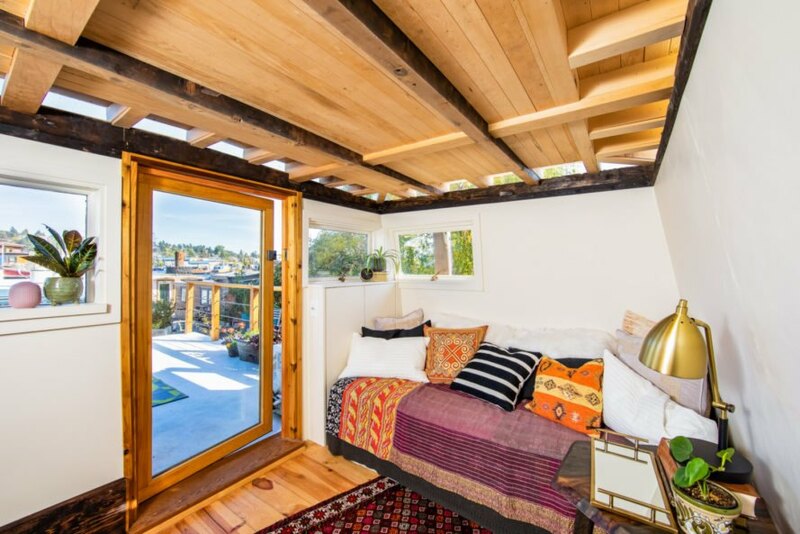 This charming cottage on the water is located on Seattle's ship canal. The interior design has many unique features. Framed art and high ceilings open up the space. Neutral tones keep the interior calm. The living space is welcoming with a large sofa and a dining area. The kitchen features reclaimed slate cupboards. The kitchen was also renovated with beautiful live-edge wood counters. The living and kitchen areas are connected with cork flooring. One of the bedrooms has an elevator bed that provides more space when raised off the ground. A Japanese soaking tub was installed in the bathroom. A small seating area leads out to the rooftop space. Ample storage keeps clutter at bay. The houseboat has a large balcony and rooftop terrace. This space is perfect for entertaining and al fresco dining. 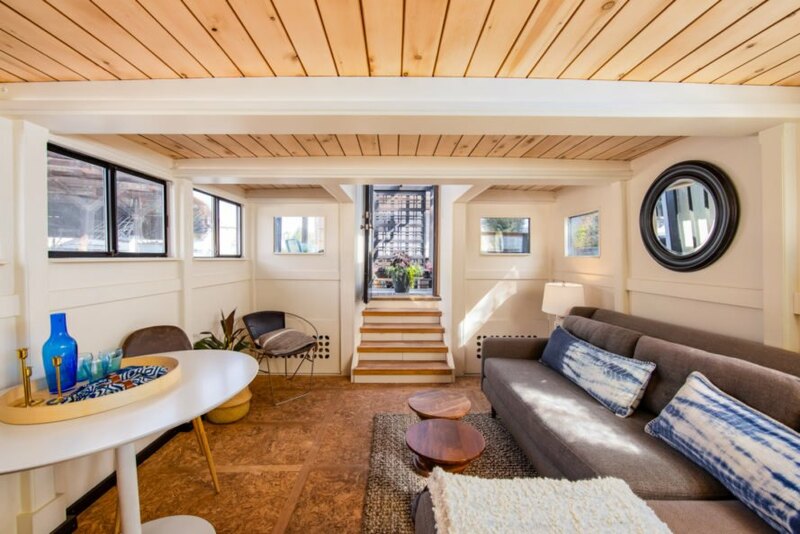 The houseboat is currently for sale for $375,000.